Wuthering Heights is Emily Bront 's only novel. Written between October 1845 and June 1846, Wuthering Heights was published in 1847, Many people, generally those who have never read the book, consider Wuthering Heights to be a straightforward, if intense, love story - Romeo and Juliet on the Yorkshire Moors. But this is a mistake. Really the story is one of revenge. It follows the life of Heathcliff, a mysterious gypsy-like person, from childhood (about seven years old) to his death in his late thirties. Heathcliff rises in his adopted family and then is reduced to the status of a servant, running away when the young woman he loves decides to marry another. He returns later, rich and educated, and sets about gaining his revenge on the two families that he believed ruined his life. 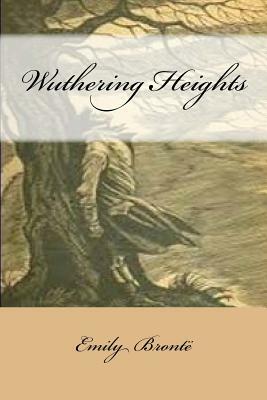 Although Wuthering Heights is now widely regarded as a classic of English literature, contemporary reviews for the novel were deeply polarised; it was considered controversial because its depiction of mental and physical cruelty was unusually stark, and it challenged strict Victorian ideals of the day, including religious hypocrisy, morality, social classes and gender inequality. The English poet and painter Dante Gabriel Rossetti referred to it as "A fiend of a book - an incredible monster... The action is laid in hell, - only it seems places and people have English names there.